This excerpt is from Representative Men and Old Families of Southeast Massachusetts, Vol. III by J.H. Beers & Co. While the family bearing this name is not an ancient Fall River family, it is one of a third of a century’s standing here and one that has given a good account of itself fn the city, where father and son, the late Alexander Lawson and Police Commissioner Frederick W. Lawson, have wrought well; brief outlines of their careers follow. Alexander Lawson, son of John and Ellen (Bremner) Lawson, was born in Boharm parish, Banffshire, Scotland, Oct. 31, 1838. Along in the early seventies of the last century he came to America on a kind of inspection tour, and after satisfying him6elf of the desirability of this country as a place of opportunity, returned for his family and all came over, locating first at Hallowell, Maine, and a short time later at Westerly, R. I. This was in 1872. Mr. Lawson was employed in the latter place for a period of years, working at his trade of granite cutting. 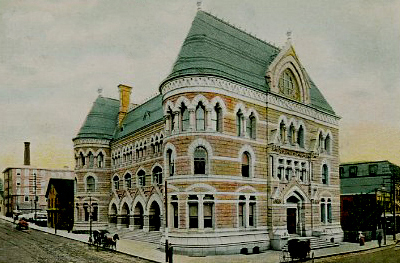 Five years later, in April, 1877, he removed to Fall River to work on the carving of the then new post office building and customs house. He was for three years thus occupied in carving the capitals of some of the columns on Bedford street and some of the more elaborate parts on Second Street. With the excellence of his handiwork the government inspector was greatly pleased, inquiring who did it and remarking, “That is as fine a piece of work as there is in this country.” When Mr. Lawson completed the work upon the post office for which he had arranged, he established the monumental works at the entrance of Oak Grove cemetery. For a time in the beginning he had a business associate, but for some years before his death he did business alone. He possessed artistic taste and was an excellent designer. Perhaps his largest works in the way of monuments were those of the Stafford and Davol families, the latter being the largest and most expensive of any up to that time cut in Fall River. Mr. Lawson was a man of strong religious convictions; next to his family was his church, and the church of which he was a member had no more devoted and faithful friend, he giving liberally to its support, according to his ability, and with fidelity and wisdom managed its finances. He at various times held and creditably filled every office within its gift. He united with the Third Congregational Church of the city in 1877, and the next year was chosen clerk of the society. In 1879 he was chosen deacon, and by successive elections continued such relations until the final summons came. He was from the beginning a teacher in the Sunday school of the church excepting the period of his service as superintendent. As a member of the managing board of the Children’s Home, of the Scottish Clan McWhirr and of King Philip Lodge, Fall River Royal Arch Chapter and Fall River Council of Masons, as well as in business, he had been brought into relation with people in all parts of his adopted city, by all of whom he was held in the highest esteem. All who had business dealings with him had occasion to feel the utmost confidence in his word. What he said could be relied upon, and what he promised .he made every effort to perform. He never wronged anyone intentionally. He was a just man, always carrying on his business with strict regard to equity. The wife of Alexander Lawson, to whom he was married June 22, 1867, was formerly Christina G. Rae, and she survives him, residing at No. 710 Prospect street, Fall River. Their children were: Isabelle, who died in 1896; Frederick W.; Mary J., who died in 1896; Alonzo W., who is superintendent of the Lawson’s Marble and Granite Works (he married Amey V. Hill and has two children, Dorothy Vernon and Alden); Henry H., a traveling salesman, who resides in Fall River (he married Lillian Sumner); and Christina H., who is connected with the public library at Fall River. Alexander Lawson died in the afternoon of Jan. 19, 1891, at his home on Prospect street, Fall River, Massachusetts. Frederick W. Lawson, son of the late Alexander and Christina G. (Rae) Lawson, was born Dec. 11, 1870, in Aberdeen, Scotland. He came to this country with his father’s family in 1872, the latter stopping for a time in Hallowell, Maine, later removing to Westerly, R. I., and in 1877 to Fall River, this Commonwealth. In 1880 the father established the granite and marble monumental works on Prospect street, near Oak Grove cemetery, as referred to in the foregoing. The son, Frederick W. Lawson, acquired his education in the public and high schools in his adopted city, Fall River, being graduated from the latter in the class of 1888. After his graduation he was employed for three years in the King Philip Mills, resigning his position at the end of that time to take charge of his father’s business, his father having died in January, 1891, since when he has actively and successfully prosecuted the same. Commissioner Lawson, for he is now one of the board of commissioners of the police department of Fall River, has been active and prominent in public affairs. He was appointed commissioner in the summer of 1909, by Governor Draper, to fill the unexpired term of the late Rufus W. Bassett, and in May, 1910, was reappointed for the term of three years. He has served as a member of the common council and for one year was president of that body. Later he was one of the efficient aldermen of his ward, serving three years (1902-03-04) as a member of the board of aldermen and as chairman of the board, 1903 and 1904. He was candidate for mayor at the Republican municipal caucuses in 1904, and was second in a three-cornered contest, being defeated by Hon. George Grime, then mayor of the city; he was the unanimous choice of the Republican party as its candidate for mayor at the municipal caucuses in 1906, but was defeated at election by Hon. John T. Coughlin. He also took an interest in military affairs, being a member of Company F, Naval Brigade, for some eight or ten years, and from the beginning of the Spanish-American war was acting boatswain’s mate on the United States ship “Lehigh,” until that vessel was put out of commission and its crew discharged. Commissioner Lawson is a member of King Philip Lodge, A. F. & A. M., and Fall River Chapter and Council, being a’ past master of the lodge and council. He is a prominent member of the Fowler Congregational Church, of which he was elected a deacon within a year or two after the death of his father, and he has since continued to hold that office, in addition to being superintendent of the Sunday school for a number of years, until January, 1911. On June 26, 1901, Mr. Lawson was married to Elizabeth J. Carnie, of Westerly, R. I., daughter of Henry and Euphemia Carnie, who are now residents of Providence. They have one son, Henry Carnie, born Feb. 10, 1907. Mrs. Lawson is a member of the Fowler Congregational Church.